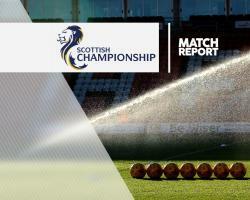 Dumbarton saw their Ladbrokes Championship survival hopes suffer a blow after two late goals condemned them to a 2-0 home defeat against Dunfermline. Dumbarton had the best chance of the first half in the 33rd minute when Darren Barr headed the ball into the path of Gregor Buchanan but he could only fire his effort straight at Sean Murdoch. Andy Stirling then fired narrowly wide from David Smith's cross early in the second half for the hosts. The Pars went ahead with 10 minutes remaining when Dumbarton failed to clear properly and Rhys McCabe drilled a low effort into the net. And they wrapped up victory five minutes later when a flowing move was finished by David Hopkirk.